File contains the transcript of the conference's morning and afternoon sessions from February 5, 1976. The conference was sponsored by the United Nations Institute for Training and Research (UNITAR) and the International Ocean Institute (IOI), participants included Arvid Pardo, Sidney Holt, Jan van Ettinger, Elisabeth Mann Borgese, among others. 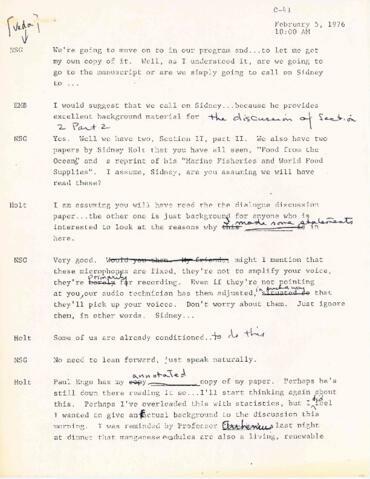 Some of the transcript pages have handwritten annotations. This file also contains a partial transcript from an unknown date. Part two of this file is located in file MS-2-744, Box 111, Folder 4.